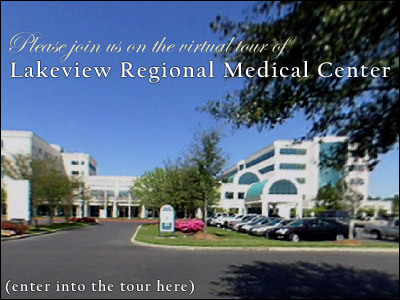 Lakeview Regional Medical Center is part of HCA, the largest healthcare corporation in the world with over 180 hospitals throughout the United States and Europe. Lakeview Regional is a full service, acute care hospital licensed for 178 beds dedicated to providing quality inpatient and outpatient healthcare services. Lakeview Regional's main campus is located north of Lake Pontchartrain on a 53-acre campus between Mandeville and Covington, Louisiana. Convenient access for residents of Mandeville, Covington, as well as the rest of St. Tammany and surrounding parishes, makes Lakeview a popular choice to receive inpatient and outpatient health care services. In addition to the main campus, the Lakeview Specialty Center, located approximately seven miles from the main facility, provides specialized services. Licensed for 16 beds, Lakeview Specialty Center provides Sub-Acute and Pain Management services. Lakeview Regional Medical Center & Lakeview Specialty Center are the only hospitals in West St. Tammany Parish to have received Accreditation with Commendation from the Joint Commision on Accreditation of Healthcare Organizations. Accreditation with Commendation is the highest certification attainable through the JCAHO regulating body, and Lakeview is proud of the certification affirming a high level of quality patient care and service. Lakeview Regional Medical Center's technologically advanced, comprehensive services include bone density screenings, cardiology and vascular, emergency and urgent care, radiology, rehabilitation, stroke care, surgical weight loss, and women's and children's services. Lakeview Regional Medical Center is an innovative hospital, actively involved in the community and committed to exemplifying exceptional patient care. Above all else, Lakeview Regional Medical Center is committed to the care and improvement of human life. In recognition of this commitment, we will strive to deliver high quality, cost effective health care in the communities we serve. In pursuit of our mission we believe the following value statements are essential and timeless: We recognize and affirm the unique and intrinsic worth of each individual. We treat all those we serve with compassion and kindness. We act with absolute honesty, integrity and fairness in the way we conduct our business and the way we live our lives. We trust our colleagues as valuable members of our healthcare team and pledge to treat one another with loyalty, respect and dignity. We will be innovative and responsive in meeting the needs of our customers in the changing healthcare environment. We strive to continuously improve the care delivered, focusing on the safest systems for patient care. We value and encourage continuing education, professional development and personal growth for our employees and physicians. Since our doors opened in 1995, Lakeview Regional Medical Center has been an integral part of the Northshore community, offering caring, empathetic support to our patients along with specialized, high-quality healthcare. As a full-service hospital, Lakeview Regional Medical Center is committed to providing the community with a complete spectrum of care. We also believe our responsibility extends beyond the confines of the hospital doors. To that end, Lakeview Regional Medical Center has taken an active role in giving back to the community. From sponsoring fundraisers, partnering with local schools, and offering health screenings for all members of our community, Lakeview Regional Medical Center is dedicated to making the Northshore healthier. Covington is located just north of Lake Pontchartrain and only 40 miles from New Orleans in southeastern Lousiana. The weather in Covington is IDEAL!! Long springs and extended falls bring average temperatures in the 80s during the day and the 60's during the night. Here the relaxed pace of friendly, country living joins the marvelous advantages of a thriving art community, numerous festivals, Mardi Gras parades, restaurants, antique shops, water and boating activities, and opportunities galore. Visit our historic downtown district, nestled along the Bogue Falaya River, with its turn-of-the-century charm and mossy oaks, where strolling and shopping amid parks and sidewalk cafes are a dream come true. Covington offers a wide array of festivals, events and outdoor activities for the entire family. We boast some of the finest educational facilities in the State. Some of the activities include: Mardi Gras festivities, Heritage Festival, Bluesberry Festival, Fourth of July Festivities, Antique Town Fair, Historic Home Tours, and the St. Tammany Parish Fair.